Knee arthroscopy simply means putting a camera into the knee joint and having a look around. What’s really important is why a knee arthroscopy might be performed and what might actually be done inside the joint. Knee arthroscopy was first introduced into the UK in the mid-1970s, from Canada. It was in the 70s that we first began to appreciate the true importance of some of the structures inside the knee such as the meniscal cartilages, and arthroscopy offered surgeons the first opportunity to perform more delicate, less invasive tissue-sparing procedures in the knee. Nowadays, knee arthroscopy is one of the most commonly performed and most successful orthopaedic operations. It is normally performed under a general anaesthetic (so that the patient feels no pain and so that the muscles around the knee are relaxed) and as a day case procedure (in and out of hospital on the same day, with no overnight stay). Normally 2 (or sometimes 3) small 5mm incisions are made at the front of the knee. 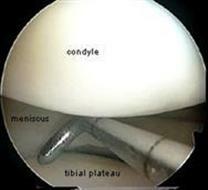 A long thin telescope with a digital camera at the end is passed into the knee joint through one of the incisions and the knee joint is filled with pressurized saline (salt water). The pressurized water helps to wash out the knee and also provides pressure to prevent bleeding. 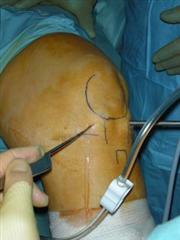 Probes and tools can then be passed into the knee via the 2nd incision at the front of the knee. Sometimes a third incision is needed just above and to the side of the kneecap, particularly if a better view of the back of the kneecap is required. 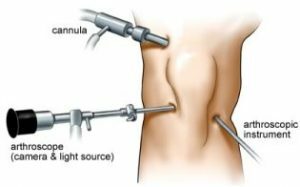 Most arthroscopies take about 30 minutes or so, but this depends entirely on what is found in the knee, and therefore what is actually done. For example, a small meniscal cartilage tear that needs just a minor trim, with nothing else wrong inside the knee, might take 20-something minutes. However, arthroscopic meniscal transplantation with ACL reconstruction and articular cartilage grafting is a major procedure that can take over 4 hours! As you can therefore see, lumping everything together under the single banner of ‘a knee arthroscopy’ is deeply over-simplistic and potentially misleading. looking into the front of the knee joint. The aim of this website is to give as much information as possible about everything related to knee arthroscopy, to empower patients and enable people to make truly informed decisions about what they may or may not wish to have done about any particular knee problem that they might have. CLICK HERE to read Mr McDermott’s ‘Patient Advice Sheet for people due to undergo Knee Arthroscopy surgery.